And that kid in OH that got killed because he had a BB gun around cops. As a kid, I remember being confused when a cop DIDN'T shoot a robber when he caught up him after a chase. I based my young knowledge on the workings of law enforcement on how justice worked at my house. You did sumthing bad enough a parent quickly caught you and meted out the justice of a spanking. Also I was influenced by TV. Marine Boy and Speed Racer and Johnny Soko and His Flying Robut and the Adventures of Superman. Get Smart. Various 40s movies that came on at noon on Saturday. It always seemed, to me, then, that the cops would show up, see a crime being committed, and open up. Obviously I was confused. But I knew I didn't want the police to see me on anything but my best behavior. To save me skin! Silly, I know. So is having the assumption that everyone grows up like that. This is odd. The game takes blood every time you are shot. Ick, needles, how bout one that shoots you with a BB/airsoft in a FP game? Should be easy to rid up with the same principle as the vampire device as in the link, and you wouldn't be outside of have a BB gun in your hand so it is safer. Stevie Wonder said: "The Only People Making Money Are the Gun Factories and Mortuaries" in response to the Ferguson thing. Also, Mr. Wonder, that big gun factory Colt is having financial difficulties and may be bankrupt any minute now. So they aren't making THAT much money. They're Comin's Right At Us! Here's your sign, numbnuts. Take a few pics of the apex that will eat you in the near future. Wanna know how to tell the difference between a wild bear, which can be super dangerous, and a tame bear, which is perfectly safe? A wild bear looks like an animal. A tame bear looks invisible. Or like a plush toy. Because there is no such thing! I heard that there was Testimony by Officer Wilson, that duing the struggle with Brown in the car, he unholstered his pistol and pulled the trigger two times with nothing happening. Third time it went off and didn't hit anyone, but scared the crap out of both of them. Ok, what happened THERE? Click click bang? Talk about pucker factor. How can that even happen with what was clearly a semi auto, based on other evidence. Word is the fake 1911 pistol had had it's orange tip removed. Not having been there, I can't say for sure how contributory that was, but if true it certainly didn't help matters. Ohio lawmakers are thinking of going full dayglo now on all BB guns and Airsoft and whatnot. I hear. RUMINT. I don't know what help that would be, they still make black Krylon. This goes both ways. Didn't some knucklehead OC an AK47 folder and had painted the tip of a real rifle orange? WhenI was a kid, stories like this came up in the news. I was younger than 12 when it was made clear to me, with a picture from the Washington Post shoved in front of my face, to never ever fool around by pointing capgun or whatnot at a Policeman. I was impressed enough seeing the smiling face of a now-dead kid in the paper. So a 12 year old can exercise proper judgement if taught. You know what isn't helping with the Missouri thing? The liberal media sitting around for weeks shouting, constantly shouting, "LOOK AT EM! THEY ARE GONNA RIOT, SURE!" I was wondering about the spelling of that word. Bupkis. Apparently it is Yiddish. There are alternate spelling forms. Bubkes, Bopkus, etc. So, Hizzonor, Mayor-for-life Marion Barry has gone to his reward. The man loomed large over my formative years, being the ONLY mayor I knew of, Washington DC being the urban area of which the suburbs I trod orbitted. The man did not like the police and it showed in the short shrift he gave them. When the crack epidemic hit, the police had been neglected for years already and that's how Barry became mayor of the Murder Capitol of the World there for a time. His disdain for law enforcement may extend from an incident in his youth. Barry was an activist, full of beans, when he came across the grandfather of my shooting buddy, Corky. Words were exchanged between the future mayor, Corky's grandpa, and his partner, until Barry spit on them. This was the 1960s. A paddy wagon was summoned, the three entered the paddy wagon, Marion Barry got the starch taken out via a hickory shampoo, then was sent on his way. As far as the police were concerned, the matter was resolved and order was maintained. Marion Barry recalled the incident for far longer and never let it go. Perhaps I spoke too soon about the Taurus Curve. Sure, there isn't a lefty specific version yet, and sure it doesn't have sights, but what if I shoot it upside down, Jason Bourne style while shooting my 1911 in my off hand... for some reason... Yeah, this pistol might be just what I need. Tam always told me I have to work harder on my gun-fu. At least I think that's what she said... I pretty loaded the whole time at Indy NRAcon, and we didn't bother to tape record the conversation. There was a lemure present, if I recall. Ask that guy, he'll tell ya. DOJ says encryption on iPhones will cause the death of children. Encrypt your drive and kill a child. Why would you want to kill a child? I really need to cut back on my drinking. I don't think it is a 'duty' trigger. Meaning, better for race gun, less good for CCW, but it's hard to tell with Apex without really studying the website. Still legal because it's a 10 round magazine, and you can't buy bigger magazines than that in the state. The only thing is it would mean I would be playing Maryland's reindeer games. Forced to take training classes. Forced to get fingerprints. My intention is to never deal with the state while the current regulator regime exists. But that does limit my selection on what I can purchase in the future, legally, now doesn't it. And a pistol is not one of the things on the list of do-ables, really. This just seems to defy all the facts that are out there. Wonder how they fudged it? Somebody smarter and more masochistic than me is gonna fisk the study. I hope I notice when that comes out. MBtGE has a new range near him and it is nicer than the very nice facilities at NRA headquarters. A friend of MBtGE was thinking on getting a pistol and was leaning toward a .40 of some flavor, so I was enlisted to bring mine to hae a variety of pistols to try. She has been shooting before. More than a few times. And was a pretty good shot, so this was a shopping trip. Why .40? Because .40 was in fashion the last time the shooters she knows paid attention to shooting fashion. 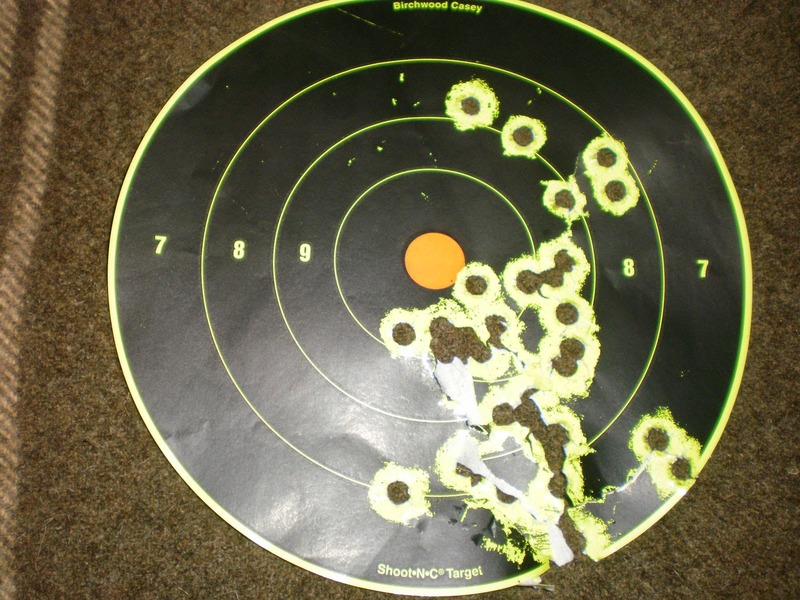 She tried out what we had, and all we had was .40, except I got MBtGE to let her try the Glock 17 he CCWs. 9mm. She liked that a lot. We also realized that somebody is gonna have to get an M&P of some flavor someday. But his range is really nice. Indoors, of course, with 40+ lanes. The backstop is shredded tires, it looks like, and they can let you fire a .50 in there. One set of lanes was 100 yards. 100! No more zeroing in the cold right before hunting season. And the place is silent. You walk in and can't hear a sound, even though 20 lanes are active RIGHT then, 20 feet away. It's amazing. The air handling system is also quit impressive. And here is a sampling of my usual work, lately. Low and right, as normal. But not like that foot low and 6 inches right. A curved pistol to be even MORE concealable and comfy. Well except for left handers. SCROO them guys. It's curved the wrong way for them. Unclean southpaws. In Maryland, gun control is not about the law. It's not about crime. It's about votes. Pass something after Newtown to pass something. To reinforce the state's retrograde Gun Crow laws. To get the guns out of the hands of Blacks and Rural Rednecky folks. THAT'll show em who is boss. There was a time when Democrats woke up and realized they were on the wrong side of history and maybe having seperate toilet facilities, schools, restaurants... one in better shape than the other... was indeed a shameful policy. I hope O'Malley is still alive when he and other Dems in this handful of backwards coastal states realize this about the 2nd Amendment. Israeli agent trying to foil the plot, and it's one of his movies just after Jaws. The villain is played by the ever creepy Bruce Dern. In a Corporal Flashback kind of role. Because all vets are PTSD powderkegs ready to explode, ya know. The idea is to attack the Superbowl by flying a modified Good Year Blimp over the game. Strapped beneath is a ginormous Claymore mine. And the Superbowl in the movie is the Pittsburg Dallas one. I thought it was the first one I ever remembered, XIII but that one was probably too late. Saw that game with me grandfather and brother in the basement TV room of our house. 35 to 31. And I remember my grandfather saying that that score reflected how he felt the quality of both teams were. Pittsburg on top, but Dallas a very close second. In reality it was probably actually Superbowl X, and it looked like the filmmakers were given unprecedented access to film parts of the movie during the game on the sidelines and whatnot. But, this is fiction... And while Staubach and Bradshaw were shown, and both participated in both games X and XIII, a president Carter was shown, glimpses from a distance, attending the game to help his sagging poll numbers and feed his supposed football fandom. He couldn't have been at X as president, and the movie came out in '77, while game XIII was 1979. So lets call the superbowl in the movie Eleven and Three Quarters.... Whatever that is in Roman numerals. Unrealistic things about the move. The Muslim partner to Dern was a smart urbane and independent muslim woman, that wasn't considered property or furniture of some muslim man's. Also there is a Colt Snubby fitted with a silencer. And that really took my head out of the movie. This movie is like Groundhog Day. But violent! We need to bring that back. Bumptious and jumped-up pencil-pushers that trod upon a body's liberty in this country used to be set up by a mob. The offending bureaucrat was then stripped nekkid in front of God and everybody, nigh-scalding hot tar was poured over their bodies, and they were breaded like a cutlet, but in feathers rather than a delicous mix of flour, bread crumbs, cornmeal, parmesian cheese, and spices. 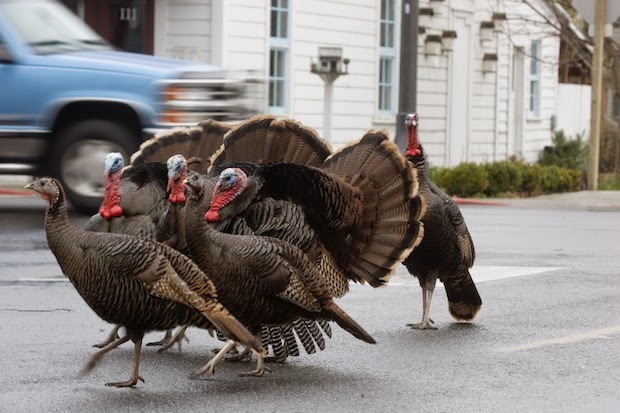 Then, more often than not, a festive parade led by the now odiferous official, riding a fence rail, proceeded to the city limits. Now, I am not saying we pour hot roofing tar over some PTA member, an alderman, or town councilperson. That is bodily harm. No, I realize we are too squeamish to do such in this day an age. We want a mob, not a lynch mob, right? Besides, it's hard to lay your hands on a hot roofing tar and a feather pillow at Wal Mart. What CAN you get easily most anywhere? Maple Syrup and blown-in roofing insulation. Looks like they could have used that agin these busybodies. 1951 anti-commie movie. A magazine writer finds wired goings on at Minnesota vacation spot. Infested with Reds and ex-Nazi scientists plotting like rats, as per usual. 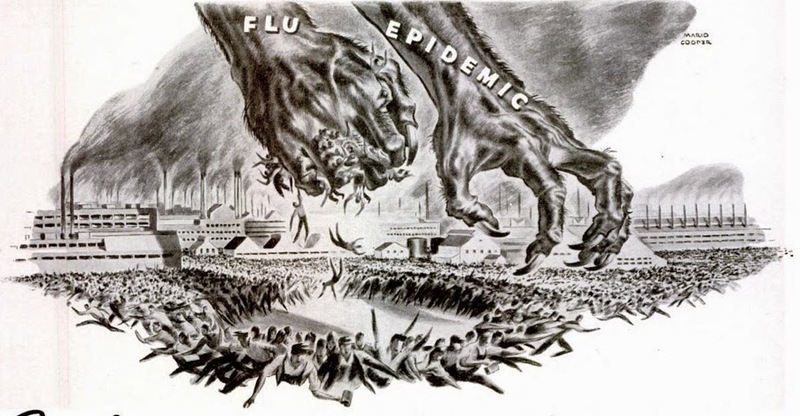 Germ warfare. The Commies had Garands guarding their nefarious lab. Six years after the big war and anybody can get the rifle that was even then issued to soldiers in Korea for that littler war. Perry Mason was a commie in this movie! And irony of ironies... The hero was played by a Liberal Democrat, Elliot Reid. So, practically a commie himself. G Men showed up with Tommy guns a-blazin at the end. 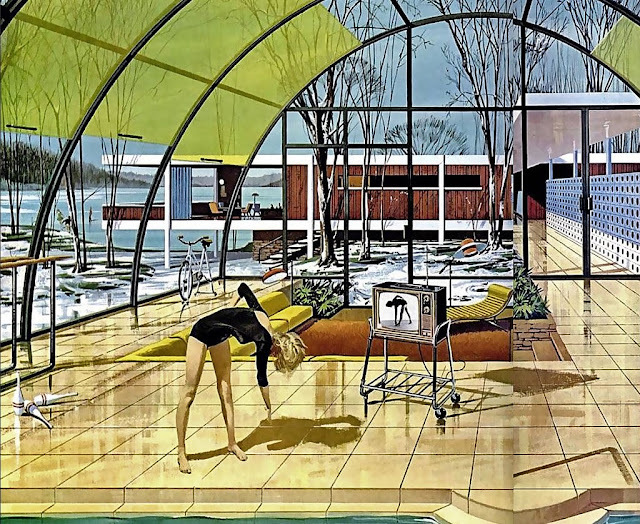 These are visions of the near future, in architecture, in 1961. This is such an odd graph. 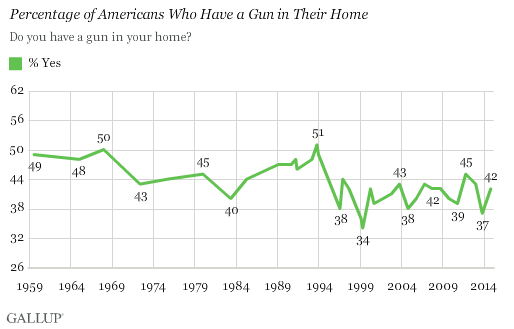 Gallup asks if you have a gun in your home. Lots of people. And do statistical analysis and junk. So, it should be kind stead. But LOOK at that graph. Between '94 and 1999, did 17% of Americans ditch the gun or guns they owned? Yeah, yeah, I know, people lie to pollsters, But THAT much? Do you think it is actually north of 50 today? Miguel was way ahead of me with the same questions. Millions of guns 'disappeared'. Sure folks get reticent about sharing such information with a stranger on the phone, but that many? The next year they fess up, the year after that they clam up... Why? I think the polling people are just being incompetent. They are contacting about a thousand people each time, randomly, adjusting to keep the sampling regular.... rehabs they change their adjustment procedures every year. That would be stupid, but they are a large old organization and could be getting complacent in their methods. A common pitfall. I have no idea how to find out the hows and whys of the way they are screwing up the methodology so bad. Well, I do if the SCOTUS is nice to us. They really seem to calm a range officer or gunstore clerk or gunsmith right down. "Lemme see your heater," is common enough thing to hear in those places, and then... it's like folks are holding their breath. Wincing even. Some yahoo is about to take an unknown quantity out of a gun rug. Even when that yahoo is me. Is this activity gonna get really loud really fast all of a sudden. I like to keep a chamber-empty flag on those guns. When they see that, everyone calms right down. Even if not wholly justifiable. Because, I mean, you can still screw up and have that flag in there AND a round in the chamber. Why, is beyond me. To go to the trouble to do something that stupid... At least the gun is clearly out of battery. Anyhoo, little yellow flag makes the appearance, and everyone exhales. And people often look down on Tapco products as cheap and flimsy, but, for this application they are just fine. No, not that Cooper. The other Cooper. Belton. Tam mentioned him after sorta reviewing the Brad Pitt move Fury, about a fictional tank battle in WWII. She said "It is apparent that Belton Cooper's work is now the accepted pop history narrative." and that made me want to get Mr. Cooper's book to see what he was on about. Cooper was a JO in the ETO, and was charged with the support of the armored forced of the 3rd. In this role he saw how tanks from both sides fared in battle. And man did he dislike Patton. 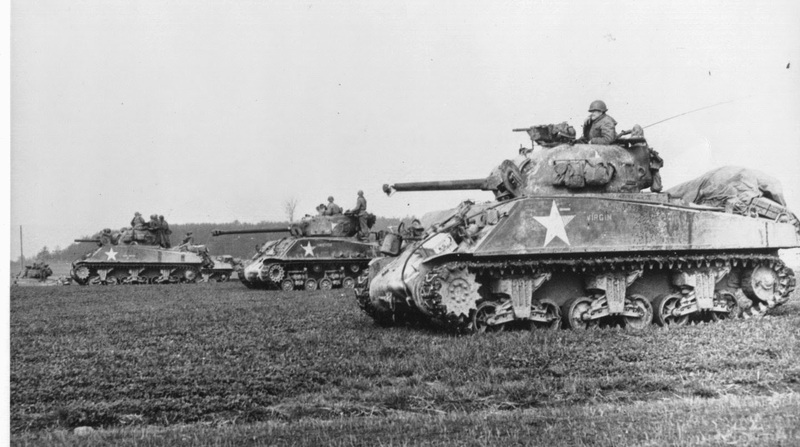 He attribute to Patton the prioritizing of the M4 Sherman over a the M26 Pershing that was being developed late in the war. To sum up both sides, Patton wanted quantity right away not a promise of quality next month. Cooper wanted the best tool possible for the Armored Warfare job, even if it meant delays, as the Sherman was inadequate for the task. It seems to me that that was what Cooper was getting at. I guess he was getting on about "oh woe is the poor armored soldiers in crappy equipment." And that is the narrative. Cooper thought everything else was top notch. Vehicles, artillery, aircraft, supply system, our Ma Deuce... Just the tanks and tank guns were the problem. Here is another online review. And of course, there is heated debate on which version of history is the 'truth'. But I read it because of the Tam reference and I didn't want to remain culturally ignorant on what seemed, and is, a major bit of contention in WWII history buff circles. Which I try to be. But I am of the 3rd camp. The point of victory wasn't from Shermans or Pershings tanks. Not metal tracks, but the long logistical tail on rubber tires and steel ships and aluminum aircraft overhead. 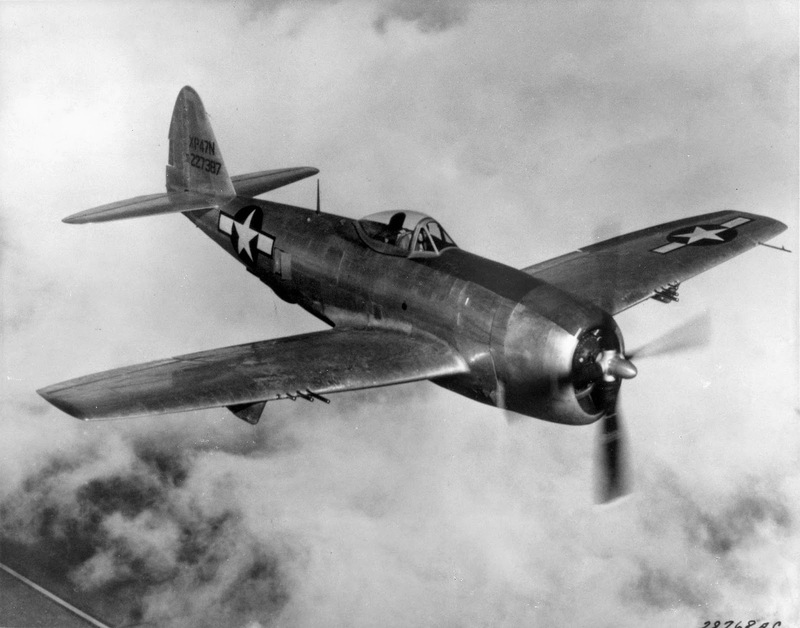 Plus similar aircraft doing a lot of the heavy lifting in the anti-armor department. But that's me. "Poor People Screw Up Everything." Poor folks in the back of the train do an uprising, and everyone suffers. Including the poor people. In Snowpiercer. But that movie, I just saw, reminded me of other movies. Elysium, but I woner why the resources were withheld in the first place in that one. Anyway, saw Snowpiercer. The secret to getting out of oppression is realizing the cops have no bullets in their magazines... Kind of an odd flick. It has some BIG names in it. A Korean production, too. It's fascinating. Like Fallout, the video game, but on a world train. Glad I didn't pay to see it in the theater, but fine offa Netflix. Has it stopped? Or have they just figured out how tamp down reports of new patients and it's spreading like wildfire throughout North America. We used to know how to react to deadly viruses in this country. A Springfield 03 has worse recoil. A Mosin Nagant has worse recoil. A bolt action 12 gauge loaded with 3" magnum slugs has MUCH worse recoil. That's what I learned taking the Barret offa my bucket list. Somebody else had this shotgun at the Range last Saturday. It was a 12 Gauge Saiga with some modifications, including to the magazines. R&R Targets. Some magazines were doubled up to hold 20 shells. 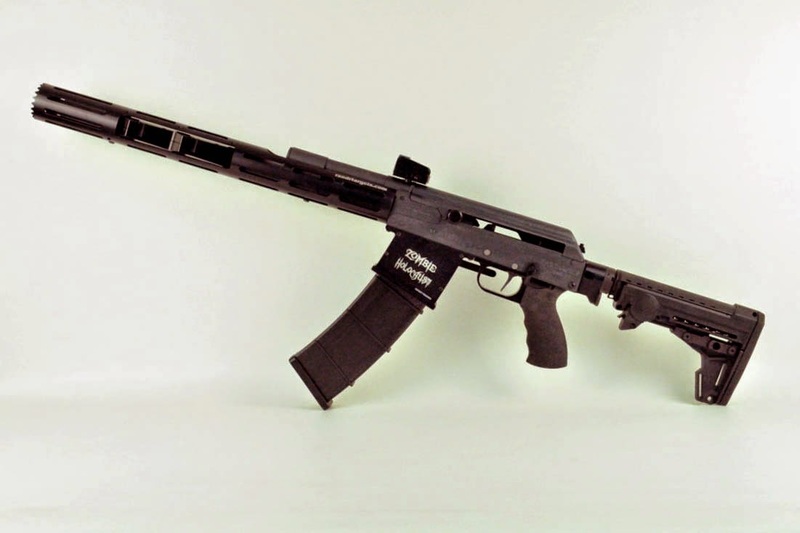 And it seemed to work better than most Saiga's I've seen. TWO big muzzle brakes, and an extended tube with a serrated end. Now you KNOW my feeling about using a 12 gauge on zombies, but the owner seemed to be having fun. Haven't eaten these since 50 mile backpacking trips on the C&O Canal. Did those with my Dad, and shared the meal with him, alternating spoonfuls out of the packaging one spoon at a time. Did two of those. 50 mile hikes. We did it on Spring Break. So the weather was iffy. We also walked North to South on the canal towpath. Because that was down hill. I am so glad it was flat otherwise. So two 50 milers of 186 miles of tow path. Plus at least on 20 miler. A few 10ers. And in the end, over the years, I walked the whole canal. I recommend the northern parts. Prettier. I discovered something hiking with that 75 pound pack. I was never an athletic kid. Even when I wasn't pudgy. I was a skinny as a kid. But I was the slowest at foot races, picked last for kickball... etc. But I found out on these long endurance hikes, that slow old me... was the same speed at the end as I was in the beginning. I was in the caboose position at the beginning of the hikes, but always finished ahead of everyone. Dunno if my constitution is like that anymore. But I was glad for it then. Another trick? I hated hiking boots. Even when the calluses formed on my heel it still hurt my Achilles tendon to wear anything with ankle support. And a canal path is flat. SO... I wore tennis shoes. People felt bad for me when it was snowing and my feet were wet in 5 minutes and their boots had mink oil on the leather... So their feet were wet in 25 minutes instead. And when the mud stuck to their feet their feet were that much heavier. So I was fine, I just had to keep moving to keep warm. Those were good trips. 50 miles in 5 days. Very back to nature. Wouldn't trade if for anything. Snow when you woke up, sleet for the first hours, then rain, then 40 knot winds with trees falling all around. The next day, sun, and 80 degrees. Campsite often had a porta pottie. So you looked for it. Because it meant the day was done. We had to carry our water as the well pumps weren't on yet. I am glad I wasn't into coffee at the time. That would be trouble. The lasagna? Meh. It's pretty good. Better than it used to be I bet. I love his stuff. God speed, sir. Offset sights are kinda neat. In battle, what if your optics break and are suddenly opaque? What if the optics are set up for long range and trouble starts close at hand? What if your AR is a race gun is set up for long range and you want to cut the transition time to close stuff? 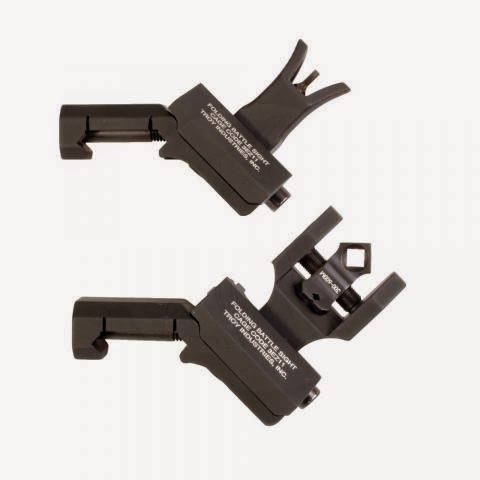 Cant the rifle 45 degrees and use the offset backup iron sights. But why so 'tall'? Off the shelf AR sights are like that for good readon. It where the sights have to be when you have a cheek weld on the straight stock of an AR. So, all off the shelf after market BUIS sights are gonna be like that, too. But if you hang the sights off the side of the rifle, then maybe they don't have to be so tall. I wonder if some supplier is thinking of a more streamlined shorter offering. I bet so. To Larry Hogan. Maryland has a Republican governor again. Which means a goodly number of Maryland Democrats crossed the aisle. The state is 66% Dem. And Larry won decisively, in a state that cheats at the polls for Dems. It wasn't a squeaker. 9 points! I guess Marylanders of a liberal persuasion have noticed all the big taxes that have come down on our wallets. This is only the second GOP governor of my state elected in my lifetime. Michelle Obama, Martin O'Malley, Brack Obama, NONE of them campaigning for the hand picked successor to O'Malley could not move the needle their way. We were promised by the Democrats that the state would be wall to wall ARs if Hogan is elected. Meh. Wish it was a firearm I liked better. But I'll take it. I'm just glad that the hemorrhage will be slightly staunched for a few more years. It's been a while since someone I voted for in Maryland actually won.... Feels ok. The biggest obstacle to gun rights in the Maryland Senate, Brian Frosh, is gone. That's the good news. The bad news is is that he is now Attorney General. This was the one that would have been the best thing to have gone our way yesterday, but didn't. Washington State's universal background check ballot initiative. Sad. No jumped up, rich, bigotted hoplophobes think they can throw their money at new Gun Crow laws like this registration-prior-to-confiscation thingy and win. That's the takeaway. Not that gun control parties lost in Maryland even with Michelle Obama helping, not with West Virginia showing gun traitor Joe Manchin the light there, no. And Bloomy recruited some DEEP pockets out there in Redmund. Are all these in your library? Survivor Library. Ebola Zombies come, you are gonna wish you had it in your Kindle. All in the public domain. It's only 100 or so gigs. You might be able to pare some out. I mean, you don't need ALL 50 books about the card game Whist. Here's the scam. No one asks you if you are an American citizen when you get your Maryland Driver's license. And motor-voter registration is practically compulsory. So now, you are on the voter rolls. And can drive legally. When your jury duty comes up, who wants to do THAT? Just tell them you aren't a citizen and you get out of it. Of course if you ARE a citizen and claim not to be, that is a crime. Too. So, they are finding people that do both. Claim not to be citizen AND are registered to vote. It's a matter of public record. One crime was committed. Anyway, lawyers are noticing this and taking these circumstances through the Maryland and Federal legal system. 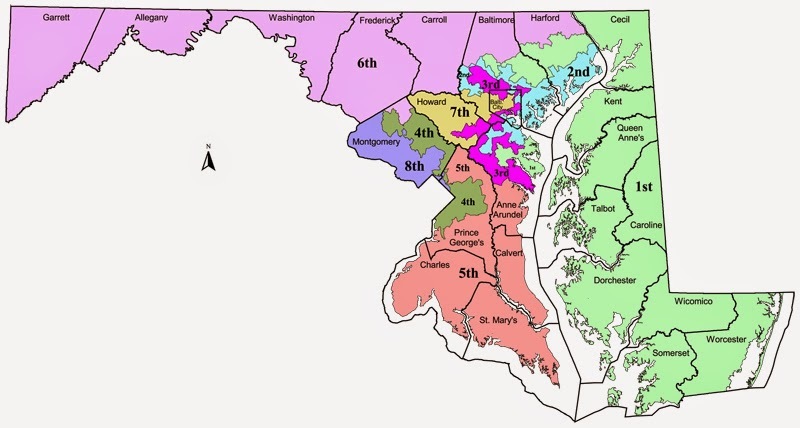 A Map of Maryland Congressional districts. I'm in 8, with Van Hollen. But my favorites are the 2nd 3rd and 4th districts for their shapes. Well, non citizens will be voting all around me today, diluting my own legal vote. That's if the voting machine doesn't switch my votes from GOP to Dem. The Dems I vote for? The machines NEVER switch those over. And I've had to put in provisional ballots in the past because the polls are sure I requested an absentee ballot so I could vote from my dorm in North Carolina. Wish they'd cut that out. It's like my state is systematically trying to disenfranchise me. But that's just here. I'm sure YOUR state is perfectly legit and above board. Lot's of usual suspects there. And some new faces. "Old NFO, JayG, Nancy and her adorably precocious daughter, Murphy, Keads, Aaron, Maureen, David, Larry the Historian, MBtAGE, Glen and his son Brendan from New York, Hayden and his wife Cara, Bubblehead Les, Stretch, John, Bruce, Joby, and Cindy." One unusual one was Hayden. He's British, you see. Wore his Squirrel Report t-shirt and everything. The only thing better than shooting a .50 and a Machine Gun is helping facilitate a former resident of the UK shooting a .50 and a Machine Gun. I was correct in my assumption that he wouldn't have brought spare 7.62x51 with him, so he got a donation from the battle packs MBtGE and I brought along just for this purpose. And we were happy to do it. Freedom! And all that. And hey, I learned a valuable skill. How to link up ammo for the belts. So I got THAT going for me. One of my personal purposes on this trip was to zero in my M1A again. Shooting at gongs the last range trip, I noticed my eyes aren't what they used to be. The tiny gray target 300 yards away disappears when I look through a peep sight, and the red dot seems huge. So I swapped the scout stope 2.5x to the M1A, will restore my Garand to 1960 US Navy issue condtion (It's a 1944 manufacture, rebarrelled to 7.62x51) and will rely on the AR for red dot optics short range stuff. So there. Knocked a few items off my bucket list at the blog shoot. So, of machine guns I've shot there is that, shot a single shot Ma Deuce (it wasn't working well that day), an MG42, an MP40, and an M2 Carbine. Thanks Murphy's Dad. I had shot a precussion cap front stuff before. And that capped job might have had rifling. But this is the first flintlock smoothbore I've had fun with. Thanks Nancy! This is the first weekend since April that Pres. Obama hasn't fit in a round of golf. Bad optics before midterms... or too cold? Been gettin lots of important stuff. The Clerk of the Court says I have a Notice of Appearance. No court knows any of my email addresses, and certainly not THAT one. There is a Neighborhood Child Predator Alert, please open this attachment. I have no children. Plus a Chinese Nigerian wants to buy my land. Music is the bane of my existence. I hate earworms, and am susceptible to them. And rare is the earworm you don't mind rattling around in your head. And the good songs grow tiresome, even, if they are up there too long. Songs on the radio alarm clock immediately delete any memory of the previous night's dream. Even more so than news announcers or commercials. I played in the school band for years. Until 9th grade. What a waste of time. And the High School band instructor tried mightily to get me to continue. No way that was going to work. I had done my time. I've never liked concerts. Either boring or loud or both. Hurt-my-ears loud. And night clubs? Even louder. And often claustrophobia inducing crowded. Because of the volume you isolated even more because simple communication is impossible. You are totally alone in a huge crowd of obnoxious sweaty people. I'd ban it with my duruthers. If I was emperor of universe. Same with dancing. And card playing. I have noticed that if you sing the jingle to the Meow Mix commercial in your head when you are shooting at the pistol range, accuracy is great improved. Dunno why that is.